Product prices and availability are accurate as of 2019-04-01 20:51:13 EDT and are subject to change. Any price and availability information displayed on http://www.amazon.com/ at the time of purchase will apply to the purchase of this product. You can save your money without compromising on quality. 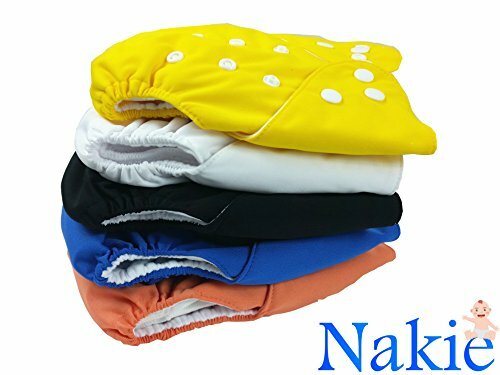 All in one Nakie baby cloth diaper is hypoallergenic and best for baby's sensitive skin when washing with clean and clear laundry detergents. Our ultra-soft diapers consist of suede cloth and polyester to wick moisture away from the baby and to reduce rashes and pink cheeks. 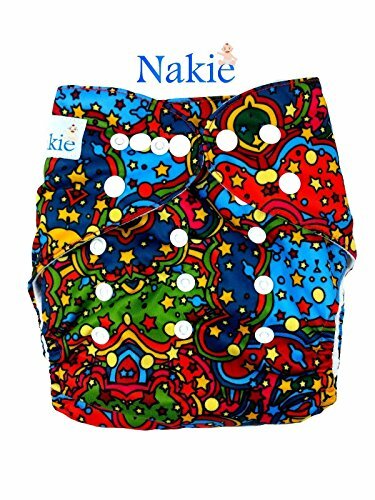 Nakie cloth diapers are an amazing alternative to commercial disposal diapers. Disposable diapers are a plight on our environment. By starting this reusable initiative, together we can preserve our planet and help to keep it safe for our children. This diaper is machine washable, reusable and easy to use again and again until your baby genius is potty trained. These diapers are adjustable. The sizes fit from small (8- 15lb), medium (12 -25 lb) or large (20- 35 lb). The easy to use snaps allow the diaper to grow with your bundle of joy from birth to potty training. It is recommended that baby's diaper should be changed every 1.5- 2.5 hours depending on their wetting habits. Together, moms and dads can simultaneously save money on diapering, AND make a difference inthe preservation of our precious Earth. To buy, click "Add To Cart" and get your order today before we run out of stock. 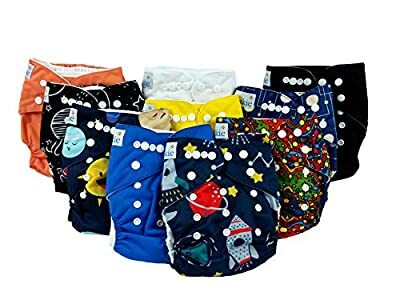 This set includes 5 solid colored pocket diapers, 5 adorable print diapers, and 10 microfiber liners. The diaper shell consists of ultra soft suede cloth and polyester, to wick moister away from baby, and to reduce rashes and pink cheeks, while remaining waterproof. (It is recommended that baby's diaper be changed every 1.5- 2.5 hours depending on their wetting habits). The bottom three rows of snaps (the rise) are for adjusting the size to fit a small (8-15 lb), medium (12-25 lb), or large (20-35 lb) child. These easy to use snaps allow the diapers to grow with your bundle of joy from birth to potty training! The pocket shell features gusset legs to help prevent leaks. Together we can avoid a wet hip in the grocery store! According to the Environmental Protection Agency, "about 20 billion disposable diapers are dumped in landfills each year, accounting for more than 3.5 million tons of waste." Cloth Diapers are an ecologically friendly alternative to commercial disposable diapers. Rest easy knowing that you are helping to preserve the world we will one day give our children.